Bandaging the Fetlock of Mile House’s first Equine inpatient. We recommend that horses have their teeth checked yearly to ensure that any problems are caught early and prevented. By looking after our horses teeth it prevents further dental problems later in life. Dental issue can cause a variety of problems in horses including weigh loss, quidding (dropping of food from the mouth), head shaking, bitting problems, swellings and sinus infections. We can castrate horses and ponies from 6 months onwards as long as both testicles have descended. We offer both 2 stage (partial) and 5 stage (full) pre-purchase examinations. 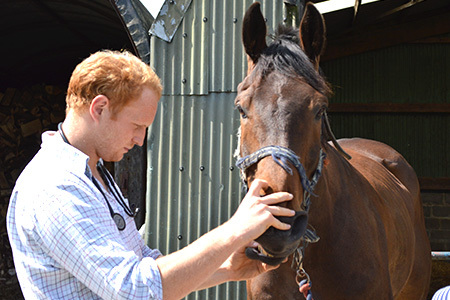 We can carry out full investigations for lameness at your yard or at the practice, where we use a variety of techniques to find the cause of the pain. 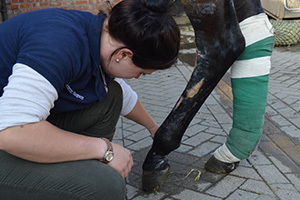 Using trot-ups, flexion tests, palpation, local anaesthesia nerve blocks and our expertise we are able to localise the cause of the lameness where necessary. With the assistance of our digital x-ray machine and good quality ultrasound machine we are able to visualise the internal structures of the horses limbs to fully assess the lameness. 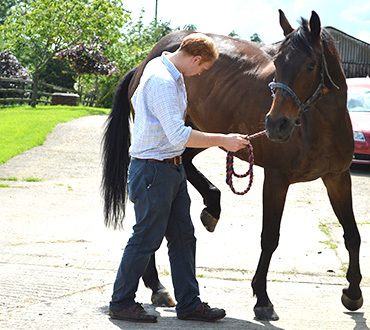 Once diagnosed we have a variety of different treatments options for each individual lameness and the ability to refer to specialist equine surgeons if required. We offer scanning and/or blood tests for for pregnancy diagnosis. Scanning be done from 21 days after serving however we recommend scanning at day 35 which enables us to ensure that there is a viable foal. Blood testing is most accurate between 40-100 days after serving and is a stress free way of diagnosing pregnancy in mares. Our vets are on call 24hours a day for any emergencies that require urgent veterinary attention. This can vary form wounds, colic, severe lameness, choke and many other conditions that affect our horses. Whether you need a vet out urgently or require advice, our vets are always on standby. We understand that any equine emergencies are stressful events to both yourself and the horses and we aim to minimise this as much as possible. if your horse is showing signs of colic (kicking its belly, continuous rolling, sweated up, flank watching, stamping feet, teeth grinding, pacing) we will come at any time of day (or night) to carry out a full clinical examination and give treatments as necessary. 97% of colics can be treated by us using ‘on yard’ medication and treatments, however 3% will be beyond the capability of medical treatment at which point we may need to refer you to specialist with surgical facilities. 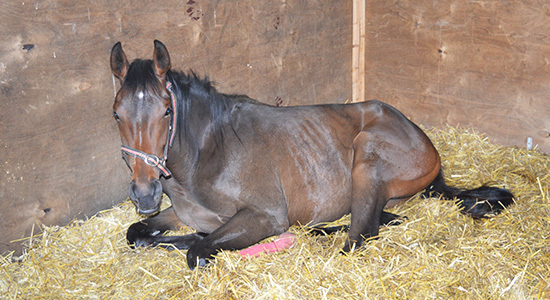 If this is the case it is important that we do this as early as possible to give your horse the best chance of recovering which is why we get to you as quickly as possible if your horse is showing any of the above symptoms. All large wounds or small woulds located in dangerous locations are emergencies to give them the best chance of a quick recovery. 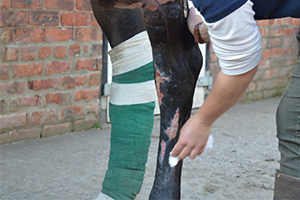 ‘Danger areas’ for wounds include over any joints (coffin, fetlock, hock, carpus etc) or tendon sheaths. If you are in any doubt as to the location of a wound we highly recommend giving us a call so we can advise on any further action needed. It is important we diagnose these fast to give the best chance of complete recovery.